On September 6th and 7th, Alameda will be host to the 3rd Annual Neptune Beach Community Celebration. The two day event will take place on Webster Street between Pacific (coincidentally where your favorite hotel is located) and Central. There are so many reasons why it will be a fun event and a great close to Summer. 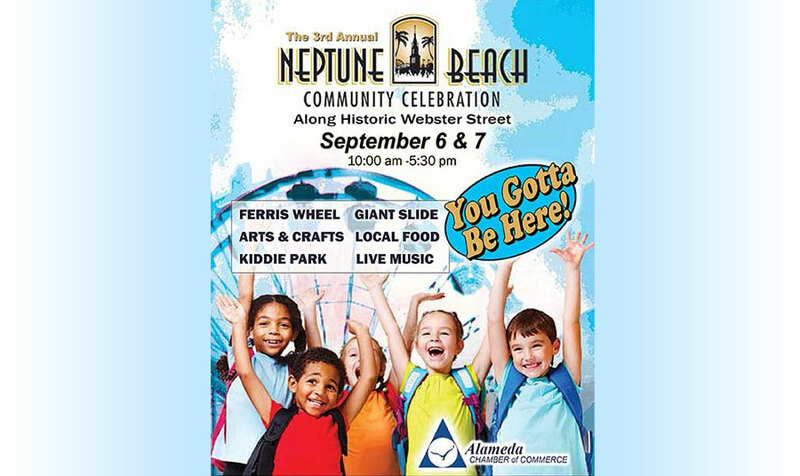 The Neptune Beach Community Celebration will feature carnival games and rides including a ferris wheel, giant slides, a climbing wall, and an inflatable obstacle course. As you walk down the street checking out all of the booths, you can jam at either end of the event to the musical stylings of bands like Alta All Stars, Soulstice, and Shake It Booty Band. You'll see booths from local artists and vendors selling everything from jewelry and clothing to home appliances and artwork. There will definitely be something there to spark your interest and may get you to spend some of the cash you have burning a hole through those wallets. The biggest draw of them all to every Alameda street fair is the food. There's too much to count. We've heard that you can enjoy foods like tri-tip and chicken wings but all of your favorite Webster street restaurants will be joining in on the fun as well. A variety of everything you may want, need or are intrigued to taste will be at the celebration just waiting for you to enjoy. When you get tired of walking, eating and shaking your booty you can always rent a room at Hawthorn Suites, you know we're here for you!